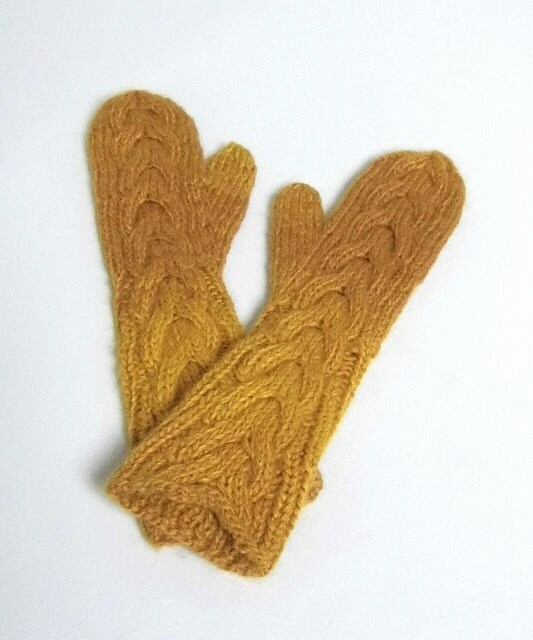 1 pair of beautiful cabled mittens will be hand knitted to order especially for you. These are created from soft and cosy 100% alpaca yarn dyed in one of 8 colours available for your choosing. Designed for a woman, they have a long arm section that can be tucked up under your coat sleeves to keep out the drafts. They stretch to accommodate width wise, with ribbed undersides on the arm section. Please see the pictures and choose your colour and style from the drop down options. The mittens can be fully closed, or left open if you prefer to use your fingers. If you would like a longer style over the fingers, but left open, please choose the full mittens and leave me a note and I will contact you. The first two pictures show mustard and grey, in both styles. These are past orders and are not in stock. These mittens will need hand washing to keep them in the best condition. Fuzziness/bobbling can occur with use, this is normal for the fibres used and a gentle shave with a razor or clothes de-fuzzer should help. If you would like these mittens created for you in a colour not available here please don't hesitate to contact me. This item was created from the Bella's Mittens pattern, designed by Marielle Henault.